Two of my great loves are children's books and STEM. I truly believe that integrating an engaging picture book with a great hands-on activity is a educational win. 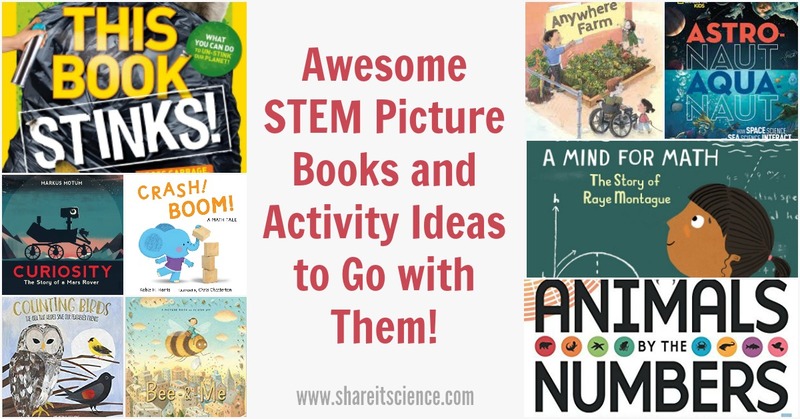 In this post I've put together some activity ideas to accompany some wonderful new picture books in the STEM disciplines. 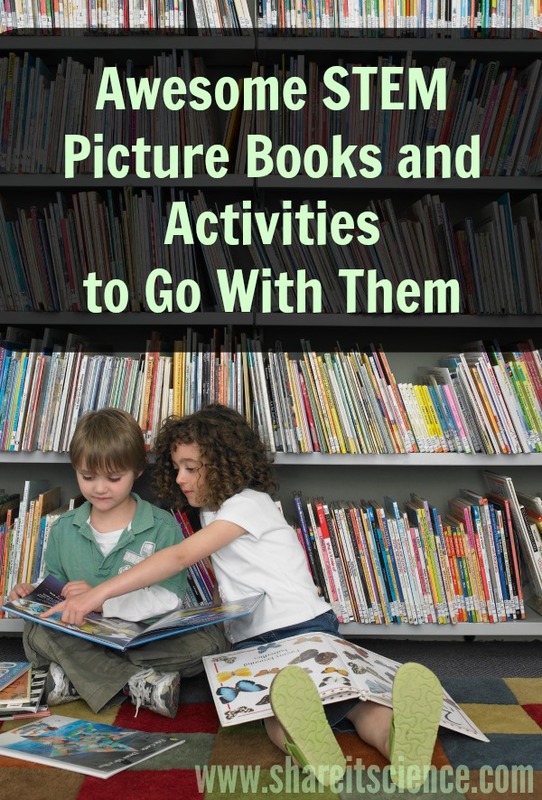 These activities will be great additions to units you may be teaching at school, or could be used to follow your children's interests at home. They would also be great to use in your library sponsored STEM club, summer camp or after school program. There is something here for everyone, from preschool through early middle school! This post contains affiliate links, meaning that I receive a small commission from purchases made through these links. Please see disclosures for more information. CRASH! BOOM! A Math Tale by Robie H. Harris, illustrated by Chris Chatterton is a cute picture book that follows the thought process of a little one building with blocks. I love it because it is something that most children can relate to as they have experimented with blocks themselves. A great introduction to early math concepts like shapes, the area of surfaces, and nonstandard units of measurement. Challenge kids to see how many blocks it takes to build a tower their height. Ask them to make a prediction before they begin! Bee & Me by Alison Jay is a sweet and fanciful wordless story about a girl who befriends and helps raise a bee in the city. The bee misses flowers, so they go collect seeds in the country and spread them around the city. This story introduces the importance of bees in a gentle, kid-friendly way. It very quickly became a favorite book at our house! Plant a bee-friendly flower garden. You'll find ideas for a pollinator garden here. Design a bee hotel! There is an easy project in the STEAM Kids book. Try a bee citizen science project. Anywhere Farm by Phyllis Root and illustrated by G. Brian Karas is a fun story illustrating the idea that you can grow food just about anywhere. It also hammers home the needs of seeds and plants. Design a creative container garden! Monitor the light your plant is getting with a light meter or the water in a pot with a moisture meter to add in some technology. The Girl With a Mind for Math: The Story of Raye Montague by Julia Finley Mosca and illustrated by Daniel Rieley is another wonderful story of triumph over adversity in the "Amazing Scientists" series. It follows Raye Montague's path to becoming the first to create a computer generated design of a U.S. Naval ship. With rhyming, kid-friendly text the story of this remarkable engineer is accessible for the elementary crowd. Animals by the Numbers by Steve Jenkins is another of his beautifully illustrated book featuring animals. Each page shares an infographic containing fascinating facts like the number of wingbeats per second for various flying animals, or how many hours a day different animals sleep. Lots of great information presented in a visually stunning way! Counting Birds: The Idea That Helped Save Our Feathered Friends by Heidi Stemple, illustrated by Clover Robin is the true story of the inception of the Audubon Christmas Bird Count and how citizen science really got started. Keep track of birds at a feeder, collect data about the species and number and then graph it. Log in to eBird and contribute your bird observation data to scientific research. Use an app to learn bird calls and a field guide to learn bird identification. Curiosity: The Story of a Mars Rover by Markus Motem is a fun look at the "life story" of one of the Mars rovers. Really understandable and informative text paired with engaging illustrations. Astronaut-Aquanaut: How Space Science and Sea Science Interact by Jennifer Swanson is a book teeming with information, photos and inspiration about space and sea research and exploration. Although it is not meant to be a read-aloud book, kids who love the ocean and outer space will pour over the pages chock-full of images and information. Check out this review and activity ideas on Growing With Science. This Book Stinks! : Gross Garbage, Rotten Rubbish, and the Science of Trash by Sarah Wassner Flynn is literally jam-packed with images and information. Sometimes the most disgusting is the most interesting to kids, and this explores all aspects of the real-world issue of waste! More Book Linked STEM Activities!